We don't know much about Bailey, but she looks very sweet. For more information on her, contact the New York Avenue shelter. Born with a V8 engine, Noella is in constant motion, playing with the other dogs and exploring the backyard. 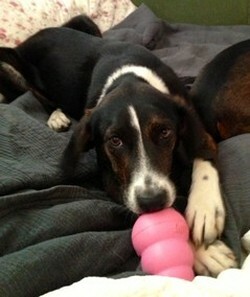 We hope that her new owner will have the time to play with her or will have another dog who is looking for a companion. After a full day of fun, Noella is ready to cuddle up and go to sleep. She gets along well with other dogs and knows to walk away when my dogs get snarky with her. She is also friendly with children. Noella also loves to eat, but is not food aggressive. She’s smart, she’s beautiful, and she’s eager to please. She will quickly show you that she knows how to sit if you have a pretzel for her! She has all of her shots and is spayed. Fenced Yard Required. Canine Playmate Is a Plus.